Bluehost vs GoDaddy Comparison 2019: Which Hosting Is Better? Home » Hosting Comparisons » Bluehost vs GoDaddy Comparison 2019: Which Hosting Is Better Among Them? Are you confused about which one to pick among Bluehost vs GoDaddy? Well, you’re in the right place. By the end of this Bluehost vs GoDaddy comparison, you’ll not only find the RIGHT hosting choice that suits both your budget and website needs but you’ll also get to know their features along with the pricing and benefits. 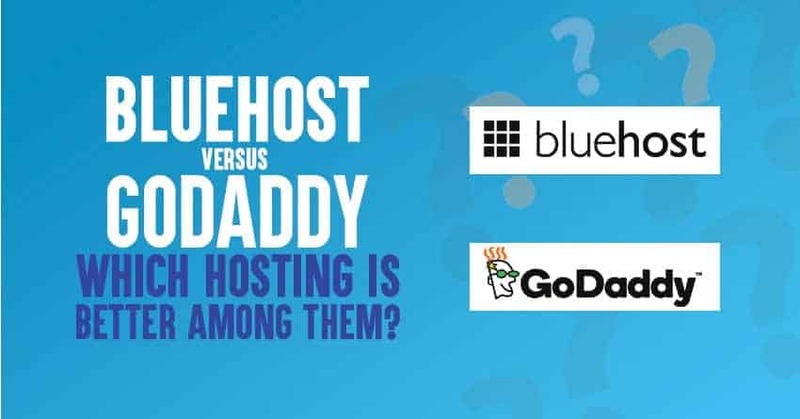 So let’s dive into the details of Bluehost vs GoDaddy to find out the best hosting among them in 2019. 3.1 Bluehost pricing: How much does Bluehost hosting cost? 3.2 Who is Bluehost most suitable for? 5.1 GoDaddy pricing: How much does GoDaddy hosting cost? Let’s first start with discussing about the top 5 features of Bluehost hosting. 1. Unlimited everything: The #1 reason most people go for Bluehost (it’s currently used by over 2 million websites worldwide) is it gives you unlimited of everything which includes the following things. Quick note: You’ll get access to unlimited of everything with all the Bluehost hosting plans except starter plans (or basic pricing plans from Bluehost). 2. Unbeatable pricing: Bluehost is always known for its cheapest hosting plans. Although GoDaddy also offers great pricing plans but just for the first year as hosting from GoDaddy gets costlier in the long run. Whereas in Bluehost, it is vice versa as you can get cheaper hosting plans for the long term plans such as 2 or 3 years. 3. Excellent security features: If you’re picking any web hosting service (be it Bluehost or GoDaddy), make sure it offers you great security features so you can safeguard your websites from getting hacked and Bluehost offers excellent security features mentioned below to provide great security. Prevent DDoS attacks using CloudFlare: Bluehost gives you access to CloudFlare CDN for free which is an excellent way to prevent DDoS attacks performed on your websites for getting access. SiteLock security: Most people are not aware of the importance of using SiteLock as it provides exceptional security features by scanning your site, looking for anything that shouldn’t be there within your site such as malware, harmful code, trojans etc and Bluehost offers SiteLock security for protection against bots and malware attacks to safeguard your site. 4. Extremely easy to use control panel: Bluehost uses Linux OS on all of their hosting plans and the best part about Linux hosting is that you get access to scripts like WordPress, Joomla and so on as standard so you can install them easily from your Bluehost dashboard. 5. 99.99% uptime guarantee: Bluehost offers you industry leading uptime guarantee of 99.99% (although there are platforms such as WP Engine, Dream Host etc provide you 100% uptime, but they are expensive than Bluehost). 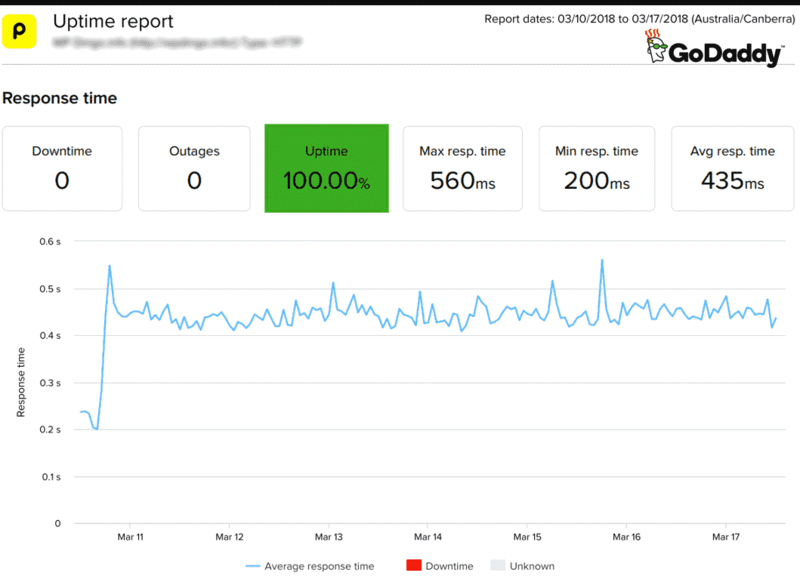 By having your sites hosted on a web hosting environment with great uptime, your audience won’t face much downtime issues while they are on your site. So Bluehost is definitely a great choice if you want less hiccups in running your site. Let’s talk about the pros and cons of using Bluehost hosting now in this Bluehost vs GoDaddy comparison for 2019. Here’s a list of all the pros of using Bluehost hosting. Here’s a list of all the cons of using Bluehost hosting. Bluehost pricing: How much does Bluehost hosting cost? Bluehost offers a wide range of hosting plans including shared hosting, VPS hosting, cloud hosting and so on. Since majority of the people host on shared hosting, let’s only talk about Bluehost shared hosting pricing plans which are divided into 3 plans. Bluehost basic: This is the cheapest shared hosting plan from Bluehost which costs you just $2.95 per month and you can install 1 website along with a free domain name and you’ll get access to the following features. Bluehost plus: This is the medium shared hosting plan from Bluehost which costs you $5.95 per month and you can install unlimited sites and you’ll get access to the following features. Bluehost prime: This is the advanced shared hosting plan from Bluehost which costs you $5.95 per month and offers you excellent hosting features such as site backup, spamexperts etc and you’ll get access to the following features. Yes, absolutely. Bluehost offers you a 30 day money back guarantee for new hosting accounts. But the guarantee covers only hosting fees and not domain registration and other fees. It doesn’t apply to renewals as well, you’ll only get your money back for new hosting accounts. Bluehost accepts payments via Debit Cards, Net Banking, Credit Cards (Visa/Mastercard/Amex/Discover), PayPal. Who is Bluehost most suitable for? Are you a blogger or an affiliate marketer? Are you planning to create multiple niche websites? Do you want to open an eCommerce store online? From creating an eCommerce store to running a portfolio website, you can pretty much create any kind of website using Bluehost as it has all the amazing features provided to you at affordable prices. If you’re not satisfied with shared hosting (considered as slow web hosting), you can go for VPS, dedicated or even managed WordPress hosting plans from Bluehost. If you’re wondering about why you should pick GoDaddy over other hosting sites like Bluehost or anything other, here are few of the biggest benefits of using it. 1. GoDaddy Hosting Coupons: The #1 reason most people host their sites on GoDaddy is it offers you a wide range of huge money saving deals and discounts every now and then. Although GoDaddy offers low priced services when compared to the other hosting companies and yet it offers you ultimate deals, coupons and discounts. On special occasions like Black Friday and Cyber Monday (which come only once in a year), GoDaddy offers discounts up to 90% or sometimes even more. 2. Offers a free domain and ICANN fee even with the basic plan: Most people don’t know that even GoDaddy offers you a free domain registration for 1 year even if you go with their most basic shared hosting plan. You’ll get one free CLUB, COM, NET, XYZ, ORG, CO, or CN with purchase of a new 12-, 24- or 36-month plan. Plus ICANN fee of $0.18 per domain name per year. 3. Offers both Windows and Linux hosting plans: While Bluehost only offers you Linux based hosting plans GoDaddy offers you both Windows and Linux hosting plans so you can pick your hosting environment according to your preferences. If you’re wondering about the difference between both Windows and Linux hosting, let us explain about it briefly so you can understand it even better. 4. GoDaddy is known for its 1 click installs: Most hosting companies (including Bluehost) don’t provide too many 1 click installs but GoDaddy beats the competition by providing you a wide range of 1 click installs which are listed below. 5. 24/7 security monitoring and DDoS protection: What if all of a sudden your site goes or web hosting server goes down? You’ll go insane, right? That’s why GoDaddy keeps an eye on their servers 24/7 throughout the year. It also offers you DDoS protection which is known as distributed denial-of-service. DDoS is simply an attack in which multiple compromised computer systems attack a target, such as a hosting server or website and cause a denial of service for users of the targeted resource. To avoid it, GoDaddy uses tools like firewalls, CloudFlare etc. Let’s talk about the pros and cons of using GoDaddy hosting now in this Bluehost vs GoDaddy comparison for 2019 so you’ll get a fair idea about how good and bad it is. Here’s a list of all the pros of using GoDaddy hosting. Here’s a list of all the cons of using GoDaddy hosting. GoDaddy pricing: How much does GoDaddy hosting cost? Just like Bluehost, GoDaddy also offers multiple hosting options but the widely used option is shared hosting so let’s discuss about the pricing details and plans from GoDaddy shared hosting. Let’s explore about each of them in detail along with the features and pricing so you will get a better idea about GoDaddy shared hosting plans. Economy: This is the starter shared hosting plan from GoDaddy which costs you $2.49 per month (much cheaper when compared to Bluehost starter plan) and offers you the following things. Deluxe: This is the mid-level shared hosting plan from GoDaddy where you can install unlimited websites which costs you $4.99 per month (much cheaper when compared to Bluehost mid-level shared hosting plan) and offers you the following things. Ultimate: This is the mid-level shared hosting plan from GoDaddy where you can install unlimited websites along with premium DNS and SSL for free which costs you $7.99 per month and offers you the following things. Does GoDaddy hosting offer money back guarantee? Yes, GoDaddy offers you a 30 day money back guarantee for new hosting accounts. But the guarantee covers only hosting fees and not domain registration and other fees. Here’s how the refund policy on GoDaddy works. Who is GoDaddy most suited for? If you’re a blogger, affiliate marketer or someone who is just getting started to create a website online for building your brand, growing your business and so on at extremely cheaper prices, GoDaddy hosting is definitely for you. Let’s now take this Bluehost vs GoDaddy comparison to the next level by talking about few of their features side by side to get a better understanding about both the hosting companies. At an average, websites that are hosted on Bluehost shared hosting environment are consistently loading at 3.2 seconds whereas at an average, websites that are hosted on GoDaddy shared hosting environment are consistently 2.94 seconds. The data is taken by using several tools like Pingdom tools and GTMetrix. Both Bluehost and GoDaddy speed go almost hand in hand, so there’s no clear winner in terms of website speed, so it’s a daw between the two. If you’re wondering about what’s difference between both the uptimes, here’s a breakdown of it so you’ll understand about their significance. If you can see from the above comparison of Bluehost vs GoDaddy uptime, Bluehost clearly wins the race by a large percentage (1 hour a year outage vs 8 hours a year outage i.e 99.99% vs 99.9%). Bluehost provides both SSL certificates, backups and SSH shell access on their shared hosting plans whereas GoDaddy gives you access to secured firewalls but you’ve to pay extra for SSL certificates, backups and so on. If you can see from the above comparison of Bluehost Vs GoDaddy security features, Bluehost clearly stays way ahead of Bluehost in terms of providing basic security features. Bluehost shared hosting plans start at around $3 per month whereas GoDaddy shared hosting plans also start at a similar pricing point but the difference will show up if you go for long term hosting plans such as 3 years hosting plan with Bluehost where you can actually save more. To put things simply, Bluehost shared hosting plans start from $2.95 per month, which is about 40% cheaper than the GoDaddy Economy plan and 60% cheaper than the Deluxe plan from Godaddy. Even, the Prime plan of Bluehost only costs you $5.95 per month. If you can see from the above comparison of Bluehost vs GoDaddy pricing, in the long term both these hosting companies cost you differently where you can save more with Bluehost, so Bluehost is the winner. Bluehost offers you a ton of features such as free domain, free SSL as standard, unlimited DB’s, bandwidth, storage and so on. Undoubtedly Bluehost is one of the very few hosting companies that offers you a ton of features at extremely affordable prices. However GoDaddy doesn’t match up with the features provided by Bluehost. Although GoDaddy also offers free domain name but its features are limited when compared to Bluehost. If you can see from the above comparison of Bluehost vs GoDaddy features list, Bluehost is the clear winner as it gives a lot more features for free whereas GoDaddy charges for the same features provided by Bluehost shared hosting plans (such as SSL, unlimited databases etc). Both Bluehost and GoDaddy offers control panels which are easy to use even for beginners and you can easily install several blogging platforms including WordPress for your site with a single click. Bluehost allows you to manage multiple sites by giving you access to unlimited MySQL databases (along with giving you access to a ton of other databases as well), while GoDaddy offers access to limited MySQL databases with its shared hosting plans. But GoDaddy also offers you an additional control panel called as Parallels Plesk panel which helps you easily manage many aspects of your account including the files, apps, email hosted on your account and it even supports Windows hosting. If you can see from the above comparison of Bluehost vs GoDaddy ease of use, it’s a draw! Fortunately both Bluehost and GoDaddy both offer multiple options to contact their customer support team 24/7 throughout the year. They offer live chat, email along with toll free telephone numbers. But when it comes to responding to customers queries, Bluehost is better than that of GoDaddy customer support. If you can see from the above comparison of Bluehost vs GoDaddy customer support, Bluehost is the clear winner. Here are few questions laid out to you which are related Bluehost vs GoDaddy which gives you a quick understanding about both hosting companies. 1. Is Bluehost web hosting good? How much does it cost to host a website with Bluehost? We’re using Bluehost on multiple sites and we never faced any glitches with their hosting, service or features so far. We also contacted their customer support multiple years over the years and we always got fast and prompt responses. So we highly recommend Bluehost over GoDaddy in terms of reliability. Bluehost shared hosting plans start at $3.49 per month and you’ll get all the incredible features such as free domain, SSL and so on. 2 Is GoDaddy web hosting good? How much does it cost to host a website with GoDaddy? Although we haven’t used GoDaddy so far (except for domain registration) but we’re hearing a lot of great things about GoDaddy especially since the last 1 year and it’s focusing heavily on getting latest technology to host their sites by providing ultimate security features. GoDaddy shared hosting plans start at $2.49 per month and you’ll get features such as free domain, 1 click installs to over 125+ platforms and so on. 3. Which is the cheapest hosting service between GoDaddy and Bluehost? If we had to compare between GoDaddy and Bluehost then both are affordable and there is a little difference between their pricing if you go for their 1-year hosting plan. If you want to save huge money then we would highly recommend you to go for Bluehost because they offer unlimited domain hosting, ultimate loading time, incredible features and so on. 4. What are the billing options available with Bluehost? Unfortunately Bluehost does not a month to month billing option so you can’t find any monthly hosting plans on Bluehost. But when you create a new account using Bluehost, you can choose to be billed for 12, 24 or 36 months as per your preference. If you’re going with 36 months (3 years) plan, you can save a lot more when compared to 12 months plan. 5. What are the billing options available with GoDaddy? Just like Bluehost, GoDaddy also doesn’t offer monthly hosting plans. But it offers you 3 months, 6 months, 9 months hosting plans along with the option to choose to be billed for 12, 24 or 36 months as per your preference. If you’re going with 36 months (3 years) plan, you can obviously save a lot more money when compared to 3 months hosting plan. To be honest, both Bluehost and GoDaddy are leading hosting companies used and trusted by millions of customers worldwide. Both offer affordable hosting plans by giving you access to their 24/7 world class support team. It all comes down to one thing: if you want a feature-rich hosting platform, go for Bluehost and if you’re looking for the largest hosting platform at affordable prices, go for GoDaddy. So what are your thoughts? Did you like the comparison between Bluehost vs GoDaddy? Share your views in the comments below.